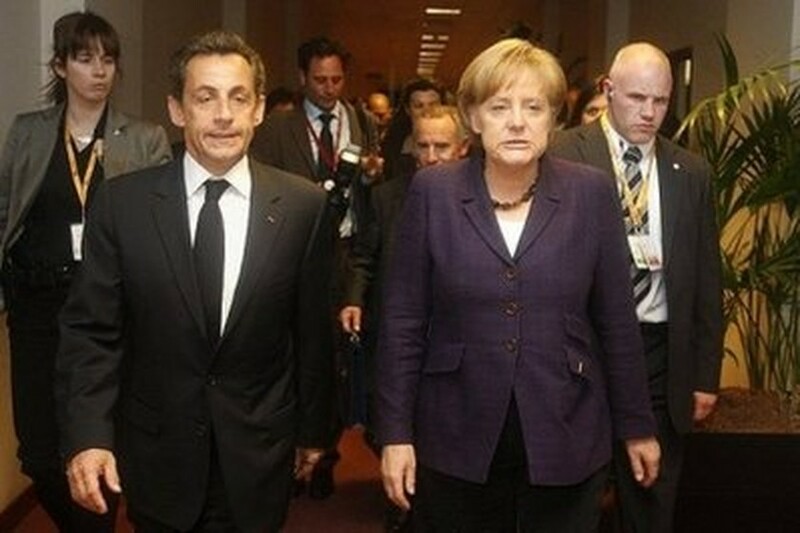 French President Nicolas Sarkozy (L) walks with German Chancellor Angela Merkel prior to an extraordinary European Union summit at the European Council headquarters in Brussels. A decision to "accelerate" public deficit reduction plans and "reinforce" rules limiting room for maneouvre on broken budgets came after they concluded a much-vaunted deal to loan debt-addled Greece 80 billion euros (just over 100 billion dollars) over three years. "We are now at the stage of community mechanism, it is the whole eurozone that needs to defend itself," through "general moblisation," the French leader said. The leaders acknowledged, during their late-night crisis summit at the EU headquarters in Brussels, that the scale of the problem had gone way beyond Greece. Parliamentary and legal maneouvres needed to sign off on an unprecedented 110-billion-euro (145-billion-dollar) bailout for debt-laden Greece, backed by the IMF, were largely completed in advance of the talks in Brussels.